The NPCs in Fallout 76 will not be gods or men, only ghouls. Specifically, it’s a new breed of intelligent ghouls who can wield guns, known as the Scorched, that will replace the AI-controlled human enemies such as raiders in previous Fallout games. If you don’t know, ghouls are zombie-like mutations of humans who have been turned into feral creatures due to prolonged exposure to radiation. Fallout 76’s ghouls, however, are a more intelligent breed who are still able to operate firearms. The only other humans you will meet in the game will be other online players, then – not NPCs. Will Fallout 76 be one of the best multiplayer games on PC? 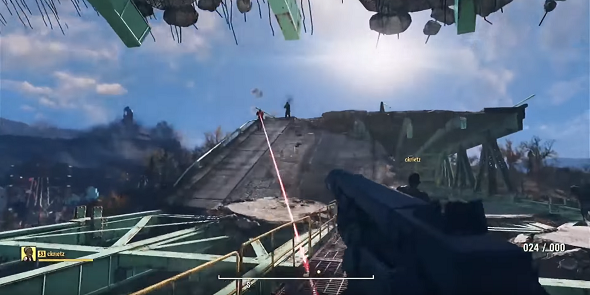 As Danny O’Dwyer notes in Noclip’s The Making of Fallout 76 documentary, raider factions wouldn’t make sense in the game’s lore, considering that it takes place 25 years prior to the other titles in the series. Joining the Scorched will be a host of new mutated creatures that draw from inspirations ranging from conspiracy theories to West Virginian myths. Monsters that we have caught glimpses of so far include two-headed possums, giant sloths, and intelligent plants. Also beware of the Mothman, a terrifying creature that stalks players who drift to far into the wild of forests of Fallout 76’s open world. We now know that we can nuke other players, which begs the question, would increasing the world’s radiation and producing even weirder creatures be possible too? We can but dream. Fallout 76 launches on November 14, 2018.